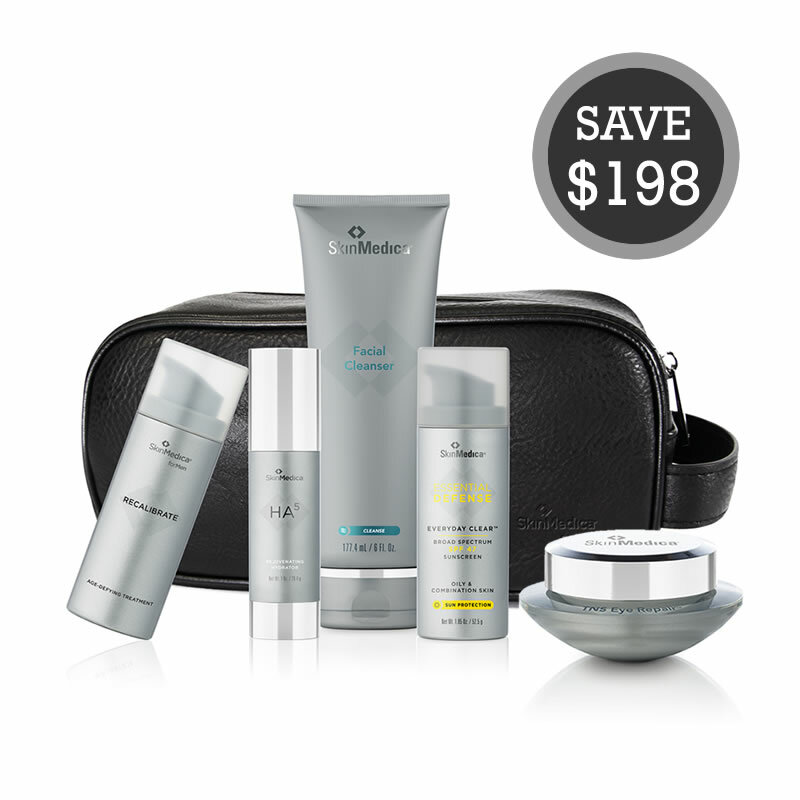 SkinMedica RegiMEN Skin Care System For Men With Free TNS Eye Repair is suitable for all skin types. 1. 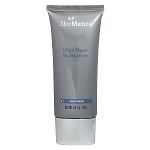 SkinMedica Facial Cleanser: Wash your face twice daily. 2. 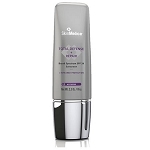 SkinMedica Recalibrate Age-Defying Treatment: Treat after Facial Cleanser twice daily. Safe to use postshave to prevent irritation, including redness and razor bumps. 3. SkinMedica HA5 Rejuvenating Hydrator: Apply twice daily after Recalibrate to face and neck for immediate smoothing and long-term hydration. 4. 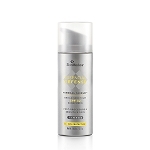 SkinMedica Essential Defense Everyday Clear Broad Spectrum SPF 47 Sunscreen: Apply to face and neck 15 minutes before sun exposure. Reapply at least every 2 hours. 5. 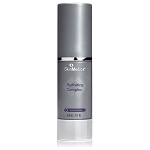 SkinMedica TNS Eye Repair: Morning and evening, after applying treatment products and prior to applying your moisturizer. 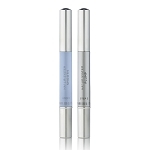 Apply to skin underneath the eyes and around the outside corners of the eye area. Avoid upper eyelid. SkinMedica Facial Cleanser: Water/Aqua/Eau, Disodium Laureth Sulfosuccinate, Cocamidopropyl Hydroxysultaine, Sodium Lauryl Sulfoacetate, PEG 150 Pentaerythrityl Tetrastearate, Camellia Oleifera Leaf Extract, Glycerin, Panthenol, Butylene Glycol, Ethylhexylglycerin, PEG-6 Caprylic/Capric Glycerides, Disodium EDTA, Phenoxyethanol, Potassium Sorbate, Fragrance (Parfum), Blue 1 (CI 42090), Yellow 10 (CI 47005). SkinMedica Recalibrate Age Defying Treatment: Water/Aqua/Eau, Tridecyl Salicylate, Propanediol, Niacinamide, Arachidyl Alcohol, Di C12 13 Alkyl Malate, Salicylic Acid, Glycerin, Polyacrylate-13, Butylene Glycol, Behenyl Alcohol, Dimethicone, Bakuchiol, Baicalin, Potassium Lauroyl Wheat Amino Acids, Palmitoyl Tripeptide 8, Centella Asiatica Extract, Magnolia Grandiflora Bark Extract, Physalis Pubescens Fruit Juice, Narcissus Tazetta Bulb Extract, Taraktogenos Kurzii Seed Oil, Nigella Sativa Seed Oil, Leptospermum Scoparium Branch/Leaf Oil, Saccharide Isomerate, Palm Glycerides, Capryloyl Glycine, Caprylic/Capric Triglyceride, Cetyl Palmitate, Glyceryl Laurate, Tocopheryl Acetate, Tocopherol, Polysorbate 20, Arachidyl Glucoside, Polydextrose, Dextrin, Amylopectin, Polyisobutene, Methyl Methacrylate Cropsspolymer, Dextran, Xanthan Gum, Laureth-23, Steareth-100, 4-Ethoxybenzaldehyde, Potassium Sorbate, Ethylhexylglycerin, Phenoxyethanol, Disodium EDTA. SkinMedica HA5 Rejuvenating Hydrator: Water, Dimethicone, HDI/Trimethylol Hexyllactone Crosspolymer, Glycerin, Butylene Glycol, Polysilicone 11, Bis PEG-8 Dimethicone, Sodium Acrylate/Sodium Acryloyldimethyl Taurate Copolymer, Sodium Hyaluronate Crosspolymer, Hydrolyzed Hyaluronic Acid, Sodium Hyaluronate, Vitis Vinifera (Grape) Flower Cell Extract, Vibrio Alginolyticus Ferment Filtrate, Alteromonas Ferment Extract, Porphyridium Cruentum Extract, Whey Protein, Plankton Extract, Trehalose, Urea, Serine, Algin, Caprylyl Glycol, Pullulan, Disodium Phosphate, Potassium Phosphate, Pentylene Glycol, Polymethylsilsesquioxane, Glyceryl Polyacrylate, Sodium Citrate, Sea Water, Sucrose Palmitate, Tocopheryl Acetate, Hydroxyacetophenone, Polysorbate 60, Propanediol, Potassium Sorbate, Citric Acid, Isohexadecane, Polysorbate 80, Silica, Decyl Glucoside, Tromethamine, Ethylhexylglycerin, Phenoxyethanol, Disodium EDTA. SkinMedica Essential Defense Everyday Clear Broad Spectrum SPF 47 Sunscreen: Active Ingredients: Octinoxate 7.5%, Zinc Oxide 12.0%. Inactive ingredients: Water, Cyclopentasiloxane, Niacinamide, Oleth-3 Phosphate, Octyldodecyl Neopentanoate, Hydroxyethyl Acrylate/Sodium Acryloyldimethyl Taurate Copolymer, Glycerin, Camellia Sinensis Leaf Extract, Polygonum Aviculare Extract, Tocopheryl Acetate, Sodium Hyaluronate, Polyglyceryl-3 Polydimethylsiloxyethyl Dimethicone, Triethoxysilylethyl Polydimethylsiloxyethyl Hexyl Dimethicone, Triethoxycaprylylsilane, Polyisobutene, PEG-7 Trimethylolpropane Coconut Ether, Butylene Glycol, Disodium EDTA, Sodium Hydroxide, Citric Acid, Caprylyl Glycol, Sorbic Acid, Phenoxyethanol, Ethylhexylglycerin. SkinMedica TNS Eye Repair: Water/Aqua/Eau, Tetrahexyldecyl Ascorbate, Olea Europaea Fruit Unsaponifiables, Tocopheryl Acetate, Cetyl Ethylhexanoate, Arachidyl Alcohol, Glycerin, Helianthus Annuus Seed Oil, Dimethicone, Butyrospermum Parkii Butter, Boron Nitride, Behenyl Alcohol, Polyacrylate-13, Human Fibroblast Conditioned Media, Palmitoyl Oligopeptide, Palmitoyl Tetrapeptide-7, N-Hydroxysuccinimide, Chrysin, Avena Sativa Kernel Extract, Stearyl Glycyrrhetinate, Camellia Oleifera Leaf Extract, Phytosterols, Tocopherol, Tocotrienols, Squalene, Oryza Sativa Bran Cera, Retinyl Palmitate, Allantoin, Panthenol, Sodium Hyaluronate, Bisabolol, Phospholipids, Butylene Glycol, Steareth-20, Polyisobutene, Polysorbate 20, Arachidyl Glucoside, Xanthan Gum, Disodium EDTA, Ethylhexylglycerin, Phenoxyethanol, Potassium Sorbate.